By Mike Jackson, Software Architect. Software management plans set down goals and processes that ensure software is accessible and reusable throughout a project and beyond. To complement our guide on Writing and using a software management plan we have now developed a prototype software management plan service, powered by the Digital Curation Centre's data management plan service, DMPonline. It is easy to concentrate on the short-term issues when developing scientific software. Deadlines for publications, collaboration with others and the demands of a daily routine all conspire to prevent proper planning. A software management plan can help to formalise a set of structures and goals that ensure research software is accessible and reusable in the short, medium and long term. It also helps researchers to consider whether third-party software to be used within a research project will be available, and supported, for the lifetime of the project. They can also give funders confidence that software they have funded survives beyond the funding period, that there is something to show for their investment. 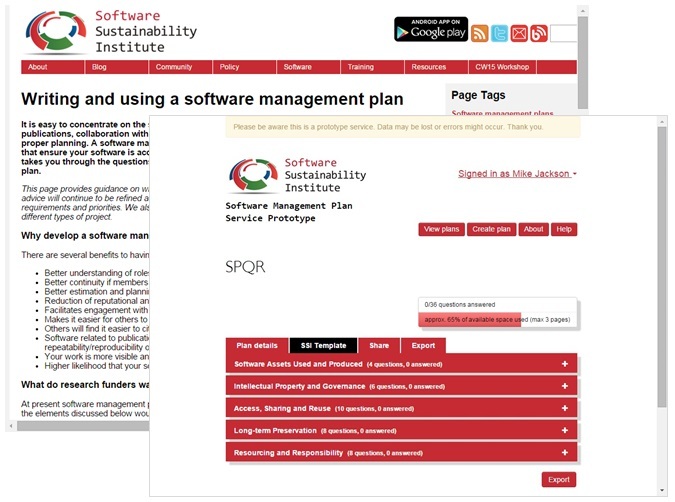 In 2012 we wrote a guide on Writing and using a software management plan to take researchers through the questions they should consider when developing a software management plan. This was influenced by work by the Digital Curation Centre on data management plans. Both our advisory board, and participants at our Collaborations Workshop 2012, suggested that we complement our guide with an online service. An online service could help researchers understand issues around research software, appreciate why software management plans are important and assist in the preparation of them. Rather than create yet another service from scratch, we decided to practice what we preach and see if we could reuse an existing research output, DMPonline. DMPonline is the Digital Curation Centre's data management plan service which helps researchers write data management plans. DMPonline is a Ruby on Rails application and the source is hosted on GitHub licenced under GNU Affero GPL. We took DMPonline, and updated its form and content into a prototype software management plan service, which is now live. The source is on GitHub. What software management plans should contain. What features a service like this should support, what questions it should ask, and what advice it should give. Overlaps between software and data management plans. If you have any suggestions then please get in touch. Likewise, we want to collect examples of software management plans that we can link to, so if you have one you are willing to share, please let us know. We are working closely with the Digital Curation Centre, providing feedback on our experiences in customising DMPonline - DMPonline has been deployed at a number of institutions around the world and the Digital Curation Centre want to make this easier to do. We will also be discussing the overlaps between software and management plans, and whether these can be combined in some way, and, if so, how. And, we'll be helping with the development of an API for DMPonline. Both Marta Ribeiro of the Digital Curation Centre and myself will be at our Collaborations Workshop 2015 this week, giving lightning talks and a demo.